Doing research prior to this expedition, I read things calling it the “most unique mountaineering route in the world” and the “toughest mountaineering route in the continental U.S.” My quick response to those statements: It’s tough to label anything “XYZ in the world,” but I do think there is some truth to both of those statements. My detailed response to those statements: Read on. 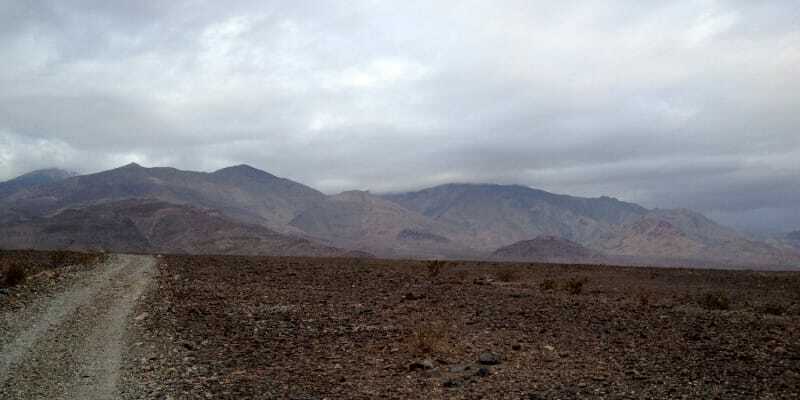 Standing very close to the lowest point in North America as the sun rose over eerily quiet Death Valley, Telescope Peak seemed very, very far away. Right there, not long after dawn, it dawned on me: it seemed very, very far away because it was, in fact, very, very far away. 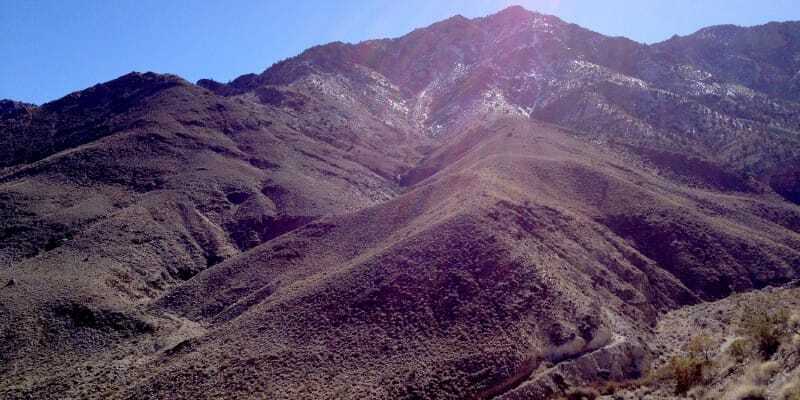 If we were to reach our ultimate destination, the summit of Telescope Peak at 11,049 ft., we were going to have to hike and climb a minimum of 15 miles and gain a minimum of 11,311 ft. in elevation in the process. Badwater Basin in Death Valley, at 282 feet below sea level, is the lowest point on the North American continent. We were starting our expedition near Shorty’s Well, which rests only about 20 feet higher than this well-known lowest point, or at approximately 262 feet below sea level. 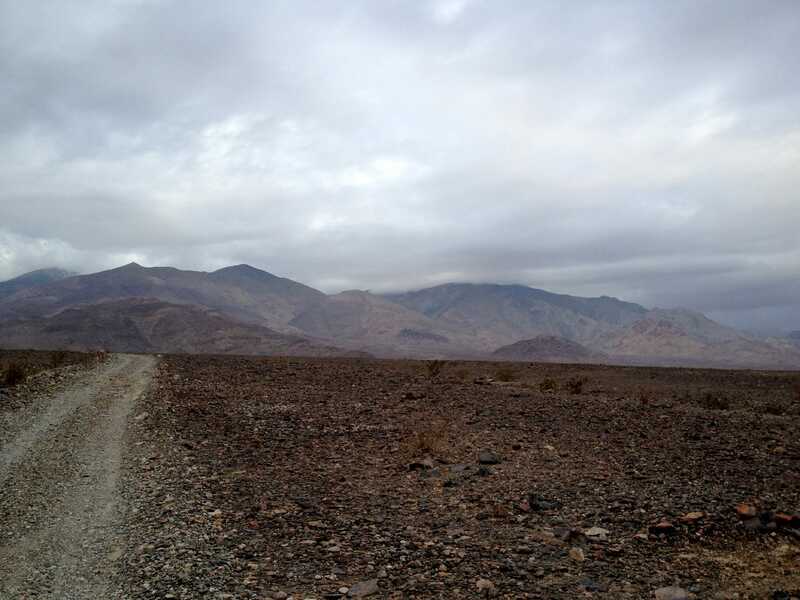 The first six miles of this infamous route, which follows an old mining road west as you head into Hanupah Canyon, ended up being perhaps the most boring and tedious. Lugging my 50lb+ pack up this stretch was tiring despite the relatively modest incline. I packed in six liters of water due to the uncertainty of finding a reliable water source on route and also packed for the possibility of having temperatures ranging from 70 degrees F to maybe -10 degrees F. This all added up to a lot of weight on my back. Sure, we were very close to the lowest point in North America at the start of our climb, but that was not the low point of the expedition for me. The low point, at least mentally, came about 7 miles into the climb, once we reached the canyon and spring. After hours battling stiff crosswinds, rain and packs that were at least 10 to 15 pounds heavier than necessary to guard against the possibility of having no water source, we looked up at the towering peak about 8,000 feet above us to the west. We had read maps, we read multiple trip reports about this route, and we had inquired about the route and conditions to other mountaineers prior to the trip. Still, we took a wrong turn. 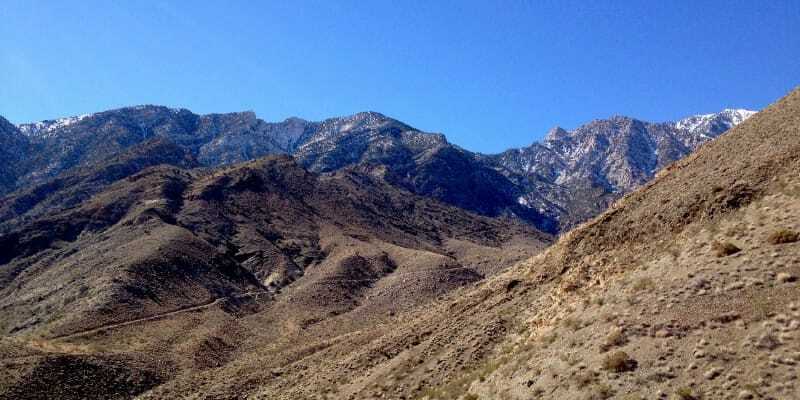 We made one bad route-finding decision and, in the end, this decision ended up squashing our chance at a Telescope Peak summit. Shortly after reaching the spring (approximately 7 miles in) we decided to turn left and head up some old mining roads. Our other option was to turn right and head up a steep scree/talus slope. The right turn/talus option looked much less inviting and we decided to follow some advice read online that suggested to head up the old mining roads. Summary: Don’t turn left, turn right! After about 11 hours on trail and after approximately 12 miles and 6,000 feet of elevation gain, we called it a day and set up camp. At this point, we were questioning the route but still believed that, at the very least, we could perhaps be on an alternate route that could end of the summit of Telescope Peak. We started the next day before dawn and ended up climbing maybe another of 1,500 vertical feet before agreeing that we were definitely off route and it was time to turn around. This stretch involved the most difficult climbing of the trip and involved a lot of route finding. The strange mine hanging on the side of a cliff about 7,000 feet up an unnamed peak that we discovered was an added bonus, but it did little to make up for our realization that a summit was now out of the question. We spent the remainder of the early afternoon scouting what we believed to be the correct route – the route that, in retrospect, should have been clear to us about 24 hours earlier. After spending a little under an hour ascending a steep class 3 scree slope to the north of the spring, we were confident that we had, in fact, discovered the route that had eluded us for the past day. We turned and headed east for the final seven miles back down to Shorty’s Well. Final tally: 34 hours on the trail; approximate 50lb packs; 26.8 miles; 10,420 feet in elevation change. This route forced me to bring all of my outdoors experience to the table for one single climb: backpacking, hiking, climbing, scrambling, winter camping and more. It’s a tough mountaineering route – very tough. The toughest? In my experience thus far, I say it’s either the toughest or second-toughest behind Mount Rainier. Impossible? I say not. If you do decide to check out this route in person, be prepared for a memorable climb that will definitely put you to the test. The spring near Shorty’s Mine seemed extremely reliable on this trip. Whether or not this is the case 365 days per year, I don’t know. But I do know that if I head back to this region, I’ll take my chances and carry much less water on the way in. Worst case scenario? The spring is dry and the expedition ends there. I’d prefer that to an additional 10 or 15 pounds on my back. Under no circumstances should you travel up the old mining roads heading south from Shorty’s Mine. I repeat: Avoid the old mining roads heading south from Shorty’s Mine. In fact, forget all the talk about Shorty’s Mine completely. The mine is actually off route and it’s completely unnecessary to even know where it is. Enjoyed your post….I attempted this route in April 2012. I successfully climbed the South Fork ridge (the right turn 🙂 ) but this was during a heat wave and I drank 4 gallons of water in a day and a half and had to turn back as I knew I would not have enough to reach the summit and get back down. The valley high my first day was 106, and the second day was 110. The next day it was 113, which was the all-time high for April. BUT, I think I proved this route is doable. The spring is reliable from all accounts I’ve ever read. I have been to it twice–250 gallons per minute is what I’ve read–an amazing oasis. I am going back there this April. I choose April because the valley heat is still tolerable, the snow isn’t usually gone, and the days are longer. Not sure what route I will take yet, but will definitely be visiting Telescope Peak and Hanaupah Spring. I may also hit the middle fork of the canyon. The left turn….while it is not the route to take to get to the top, it is a way to get to the upper part of the spring–which I recommend highly. 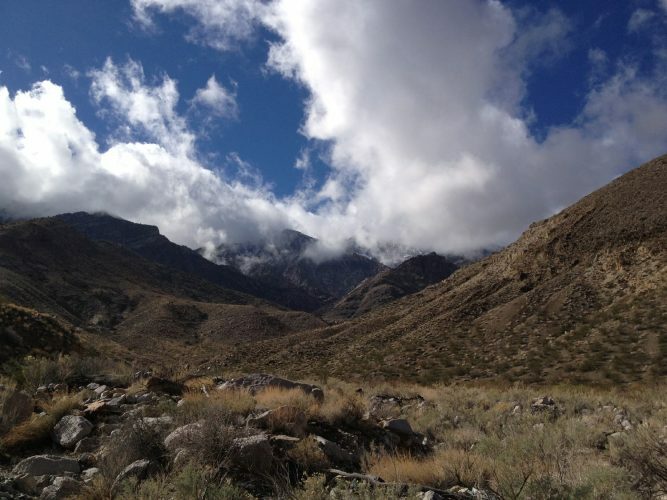 Another thing I highly recommend is hiking out to the middle of the valley–obviously, when it isn’t too hot. I have done that both in the day and the middle of the night. There is a marker marking (supposedly) the low point of the valley…a little rock saying -282 and a flag. Brian – Thanks for reading and sharing your experience on the Shorty’s route. Four gallons of water?! Wow, that’s insane. It sounds like your decision to turn in the 113-degree heat was a no-brainer. How long did it take you to get up the South Fork Ridge in that kind of heat? The left turn took us to very interesting parts of the area, and I’m intrigued to go back and explore that area some more in the future. But first things first, I need to go back and make the infamous right-hand turn. I agree the route is doable, albeit extremely tough. The spring proved to be reliable on our trip, too. Definitely an amazing oasis out there. I can’t see the route being done without it in the warmer months. Good luck on your return trip this April. If the heat and snow conditions are in your favor, I can see that extra daylight being a huge bonus. I’d say it took me roughly 3 hours to get up there from the spring. This was my first overnight backcountry trip, so I made a lot of rookie mistakes, including not getting fully hydrated before leaving the spring. I was almost out of my 2 gallons that I started with when I got there (I started from Badwater Pool and crossed the valley). I filled up at the spring and was down to my last 2 liters when I turned back. As you can see, 2012 was a very light snow year….I went back in 2013 and it was even drier. To make matters worse, there was a big heat wave in March and early April. This year was looking to be even drier still until that nice late February storm (which I guess is what rained on you!). I am hopeful that when I am there in April, there will be more snow than there was in either of the last two winters. I am not an experienced mountaineer as you seem to be, so perhaps I will be better of with a moderate amount. Telescope was awesome this year (April 10). More snow than I expected–probably the perfect amount for my first snow ascent. Post-holing above the knee, but only a few times…mostly was able to stay on top of it. I also did a test-run of coming down from the crest a few hundred vertical feet to see if I could handle coming up from Hanaupah Canyon. Tough, but doable…so one day, I am hopeful that I can get back there and do the Shorty’s -> Telescope route. I haven’t done the Cactus to Clouds, but it has been mentioned to me a couple of times. I’ll have to look into that some more. think whether or not Shorty’s to Telescope is a “mountaineering route” depends on two things: 1) What your definition of mountaineering route is. 2) What time of year it is. When I say “mountaineering route” I mean that it potentially involves a lot of different elements & skills – hiking, climbing, scrambling, route finding, map/compass know-how, etc. Because a large section of the route has no trail, I wouldn’t personally consider it a “walk up.” However, if your definition of “mountaineering route” is more of the ropes/crampons/ice axe variety then Shorty’s could be considered a “walk up” IMO, as it is a hike and not technical. But I still personally wouldn’t call it a walk up because of the off-trail and route-finding factors (and the distance) that add a lot of difficulty. If you go in winter, I think that this route is easily a mountaineering route by any definition, because you have to prepare to contend with snow/ice in the last couple thousand of feet. Whatever you want to call it, it’s a great route and it’s long – good luck! We left Shorty’s Well at 03:30 on November 12 (2016), hiked up Hanupah Canyon Road and took the steep scree hill to the right of Shorty’s mine, to the ridgeline. From there we headed up the ridgeline until we hit scree at around 7,000 ft. 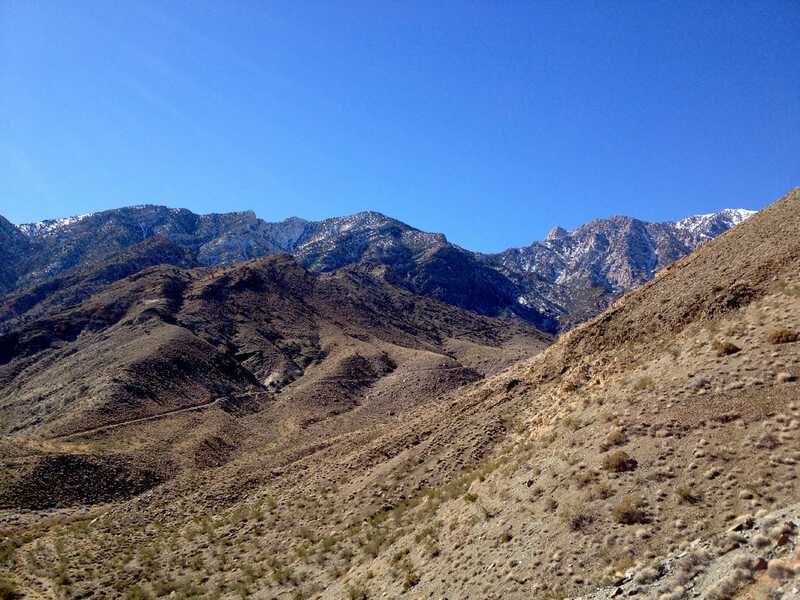 There was larger scree, medium scree, and as we got closer to the ridgeline leading to Telescope Peak, smaller scree. The small scree was the worst and seemed to take forever to get through. The 22 degree slope didn’t help matters. While hiking over the small scree, the ground seemed to always be moving under my feet. 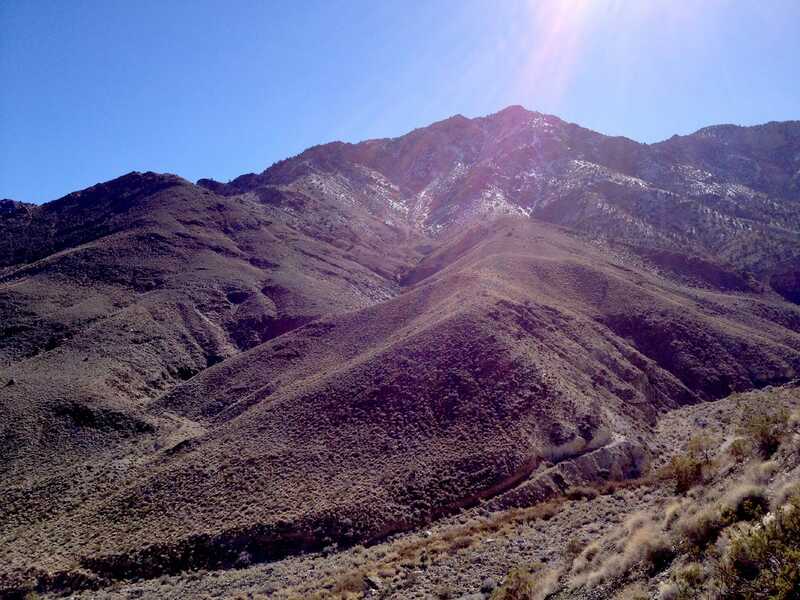 We hit the ridgeline leading to Telescope Peak at around 4:30 and by the time we got to the peak, it was dark. For the trip down, we put our headlamps on and hiked the trail down to Mahogany Flats and then hiked a dirt road to Charcoal Kilns and the car. We started in the dark and ended in the dark, around 16 hours later. The average temperature, at 71.1 degrees Farenheit, according to my Suunto Ambit3 Peak, helped a lot. The temperature never got higher than 85.6 degrees. The scree before we hit the main trail was the toughest part of the hike but that’s not to say that the rest of the hike is a walk in the park. Prior to the hike, the most elevation gain I seen in a day is during a Mt Whitney climb in July, at over 6,000 ft. I wasn’t sure what over 11,000 ft. of elevation gain would do to me, but it turned out fine. Daniel — congrats on a successful hike and thanks for sharing your journey. 11k of elevation gain is a serious day outdoors!